John Connolly was convicted of second degree murder in 2008. A Florida appeals court Wednesday reinstated the murder conviction of former FBI agent John J. Connolly Jr. for leaking information to James “Whitey” Bulger that prompted the gangster to orchestrate the 1982 slaying of a Boston businessman in Florida. In a 6-4 decision by the entire Third District Court of Appeal in Miami, the majority found that Connolly’s 2008 second-degree murder conviction for the shooting death of John B. Callahan was legally proper, even though he was on Cape Cod when a Bulger associate pulled the trigger. “It now no longer matters whether the defendant hired (procured) a hit man, turned to his mob friends to murder Callahan, served as a lookout, provided the gun, or pulled the trigger himself, he is a principal in the first degree,” Judge Leslie B. Rothenberg wrote for the majority. The long-awaited decision means that Connolly, who turns 75 on Saturday, could spend the rest of his life in prison. The once-decorated agent, who grew up in the same South Boston housing development as Bulger and recruited him as an informant, is serving a 40-year prison term at a state prison in Chipley, Fla.
Callahan’s widow, Mary, of Burlington, said she was happy that Connolly will remain in prison, but complained that the Bulger saga is endless. Connolly’s appeals court lawyer could not be reached for comment. Cambridge attorney E. Peter Mullane, a longtime friend and supporter, said Connolly will appeal his case to the Florida Supreme Court, then the federal courts, if necessary. After an eight-week trial in 2008, a Miami jury found Connolly guilty of second-degree murder for leaking information to Bulger and his sidekick, Stephen “The Rifleman” Flemmi, that prompted the gangsters to order the death of Callahan, an accountant and former gambling company executive with ties to Bulger’s gang. Flemmi testified at the trial that Connolly warned him and Bulger that the FBI was seeking Callahan for questioning and that the businessman would probably implicate the gangsters in the 1981 slaying of World Jai Alai owner Roger Wheeler in Oklahoma and two other slayings in Boston. The earlier slayings were all linked to a plot by Callahan to take over Wheeler’s company, with the help of Bulger’s gang. It was not disputed that Bulger’s associate, John Martorano, lured Callahan to Florida in 1982, shot him to death, and dumped his body in a car at Miami International Airport. 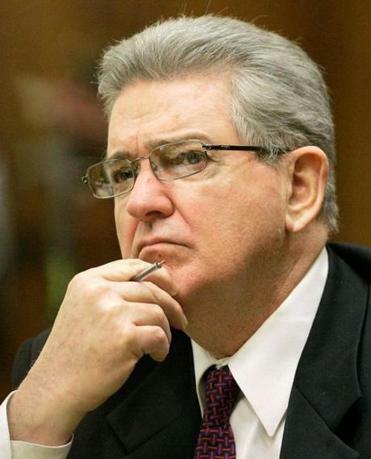 In May 2014, a three-judge Florida appeals court panel reversed Connolly’s conviction. The panel found that jurors should not have been allowed to consider a second-degree murder charge against Connolly because there was a four-year statute of limitations for second-degree murder in Florida in 1982, unless the crime was reclassified as a life felony because a gun was used in the slaying. The court found that because Connolly was not the triggerman in Callahan’s slaying, the charge should not have been reclassified and his conviction was fundamentally flawed. On Wednesday, the appeals court reinstated Connolly’s conviction, ruling that the law did not require that Connolly “be the actual shooter” or even be present during the murder or use a firearm he was carrying. The court found that Connolly’s acts, while carrying a FBI-issued firearm during his meeting with Bulger and Flemmi as they plotted Callahan’s slaying, “were imminently dangerous and evincing a depraved mind regardless of human life” and caused Callahan’s death. In two separate dissents, four appeals court judges sided with the defense and concluded that Connolly’s conviction should be overturned. In one, Judge Richard J. Suarez wrote that the majority ignored the fact that Connolly had been acquitted of conspiracy to kill Callahan and created a new standard by ruling that the second-degree murder charge could be reclassified because Connolly carried a gun that was unrelated to the slaying. “It is beyond question that Connolly’s service weapon was neither available for use nor was it used in the murder; it had absolutely no spatial or temporal relationship to the discrete crime charged; it had no purpose related to the crime charged,” Suarez wrote. Connolly, who retired from the FBI in 1990, already served a 10-year prison term for his 2002 federal racketeering conviction for protecting Bulger and Flemmi from prosecution and warning them to flee just before they were indicted in Boston in January 1995. It’s unclear when Connolly will be eligible for release in Florida. He has to serve at least a third of his 40-year state sentence, and has served about 7½ years.